Silicon Valley and the internet industry are not one and the same. I’m not going to make a long argument about this, because it’s plain and obvious. You could have made the exact same argument in 1995 but used the word “computer” instead of internet. It seems that Google and Facebook have made people forget that Silicon Valley has always been about solving problems with technology, and the technology has always been in flux. Yes, if you build a new Instagram it probably won’t become a “giant”: it will be acquired by Facebook for one billion seven hundred million dollars. In what amounts to journalistic surrealism, pundits will speculate about how they could have cut a better deal. In the meantime there are tons of technology problems not making headlines. Healthcare for one hasn’t advanced that much in the past 50 years. Even in the first world people are dying of stupid, preventable diseases. Some of them could be monitored and controlled with cheap smartphone peripherals plus data analysis. Transportation is in many ways worse than before 9/11. We fly in planes from the 1960s, but the trip takes longer than it used to: security, slower speeds because of fuel costs. These are just two problems, there are countless more. Of course the internet is a tool to solve them, just like computers and calculators. However, the companies tackling them are NOT internet companies like Google and Facebook. Sure, Google is working on self-driving cars. Still, there are 99 other problems they can’t even begin to think about. There are Silicon Valley startups working on these problems. I know a few. Ten years from now there will be multi-billion dollar, non-internet-centered Silicon Valley companies that you haven’t heard of yet. TL;DR: David Sacks, go put together a vintage car collection and stop making a fool of yourself on Facebook. Note that he said “as we know it”. Given that qualifying phrase, his statement doesn’t require Silicon Valley and the internet industry to be the same — just that Silicon Valley *as he knows it* and the internet industry are the same. 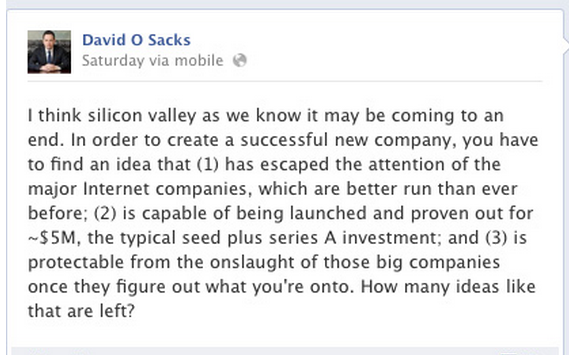 Sacks goes on to make a case focused solely on the internet industry of Silicon Valley. This cracks me up because Yammer is neither innovative in concept nor in execution. As someone that uses it, it is highly overvalued and overrated compared to its competitors and even some open-source alternatives. There’s a long line of smooth talkers and inept backers to have gotten as far as they have, given how the platform looks and functions. Sacks made a mint by rehashing a tired concept and then selling it to the dumbest money. He knows he’ll never be able to do that again, so he’s inflating his fear of future personal failure with a failure of the environment for ideas. This is the smartest insight ive seen on blogs in like 3 months. cant say it any better. Entitlement works both ways. We see it in young soon-to-be developers glamoured by the kegerating brogammer lifestyle, and we also see it in serial entrepreneurs – such as Sacks – who foolishly believe they’ve impacted the status quo to the point that they’re allowed to make such flippant statements (Thiel is also another example with his tiresome anti-college rantings). Reading Sacks’ original post brought to mind the quote erroneously attributed to Charles Duell: “Everything that can be invented has been invented.” Except in this case, we know that Sacks said what he did, and it only furthers the exasperation felt by the entrepreneurs who quietly build products and services that are meant to solve actual real-world problems. Regardless, thanks for writing this piece. I’ve been stewing over the last couple of days after reading the post on TC, and I’m glad that you were able to apply a positive and inspirational twist to a much needed critique. Dude, you gotta fix your FB like button. The pop-up to write comment in, is not displaying properly in Ubuntu FF 14.